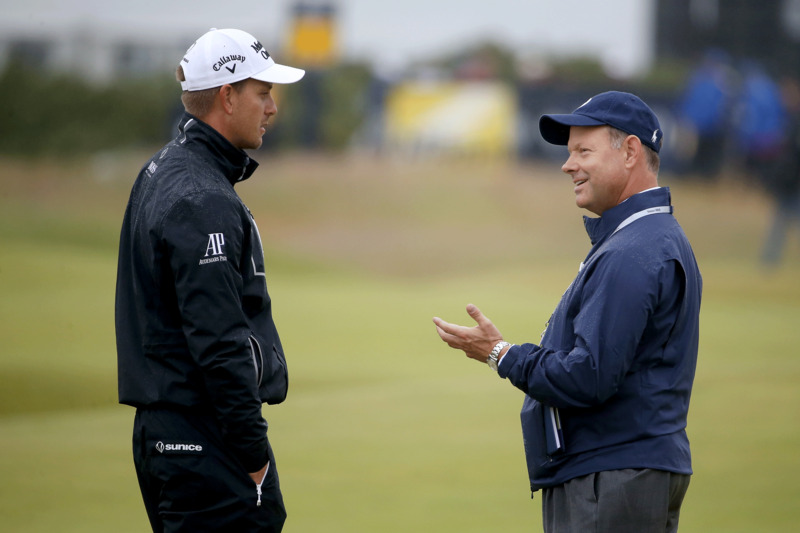 Henrik Stenson consults with USGA executive director Mike Davis at the 2015 British Open at St. Andrews. You knew about the highly publicized ban on anchored putting set to take effect on Jan. 1, 2016. 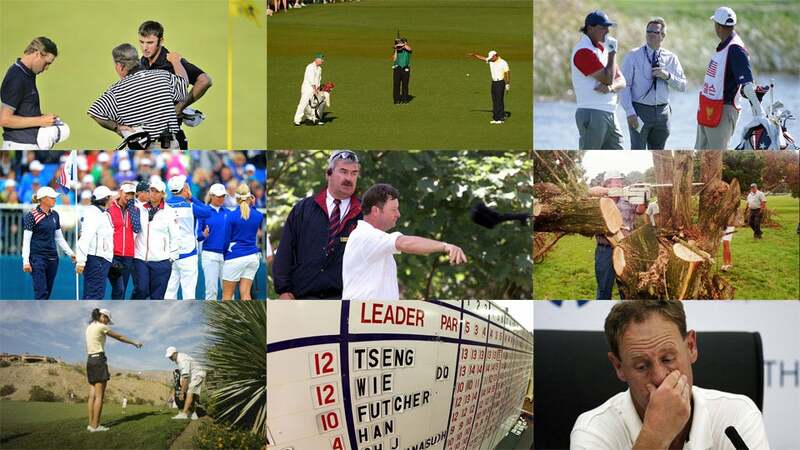 But what other alterations do golf’s ruling bodies have in store for the game next year and beyond? The USGA and R&A announced four distinct changes to the Rules of Golf Monday morning, including the ban on the anchored stroke. Withdrawal of Rule on Ball Moving After Address (Rule 18-2b) - Rule 18-2b (Ball at Rest Moved by Player, Partner, Caddie or Equipment) has been withdrawn. This means that if a ball at rest moves after the player addresses it, the player is no longer automatically deemed to have caused the ball to move. A one-stroke penalty under Rule 18-2 will be applied only when the facts show that the player has caused the ball to move. This follows a similar addendum to Rule 18-2b that was made in the previous four-year rules cycle. The current change is meant to relax the rules against the golfer in a situation in which he or she has clearly not caused the ball to move. In 2014 Justin Rose was penalized under Rule 18-2b when his ball moved. It was later determined that Rose was not at fault and the penalty was rescinded. Limited Exception to Disqualification Penalty for Submission of Incorrect Score Card (Rule 6-6d) - A limited new exception has been introduced to Rule 6-6d (Wrong Score for Hole). A player is not disqualified for returning a lower score for a hole than actually taken, when the incorrect score is a result of failing to include penalty strokes that the player did not know were incurred before returning the score card. Instead, the player incurs the penalty under the Rule that was breached and must add an additional penalty of two strokes for the score card error. In all other cases in which a player returns a score for any hole lower than actually taken, the penalty will continue to be disqualification. Several golfers in high-level amateur and professional events have been recently plagued by Rule 6-6d when notified of a penalty after having signed his or her scorecard. Now, rather than automatic disqualification, a two stroke penalty will be given if a player fails to sign for the correct score on a hole where a penalty was assessed without the player's knowledge. This rule change would have come into play at the 2013 Masters when Tiger Woods took a drop on the par-5 15th hole and later signed for a score lower than his actual score, not realizing a penalty had been assessed. At the time, the USGA disagreed with Augusta National's handling of the ruling, however this rule change would have also resulted in a two-stroke penalty for Woods, rather than disqualification. Modification of Penalty for a Single Impermissible Use of Artificial Devices or Equipment (Rule 14-3) - The penalty for a player’s first breach during the round of Rule 14-3 (Artificial Devices, Unusual Equipment and Abnormal Use of Equipment) has been reduced from disqualification to loss of hole in match play or two strokes in stroke play. The penalty for any subsequent breach of Rule 14-3 will continue to be disqualification. This rule lightens the penalty for use of gadgets like rangefinders or other distance measuring devices, particularly on first offense. D.A. Points was disqualified in 2014 for breaching Rule 14-3; the addendum would have given him a two-stroke penalty instead of a DQ. Prohibition on Anchoring the Club While Making a Stroke (Rule 14-1b) - As announced in May 2013, new Rule 14-1b (Anchoring the Club) prohibits anchoring the club during the stroke, either “directly” or by use of an “anchor point”. The penalty is loss of hole in match play or two strokes in stroke play. The long-awaited ban on anchored putting will take effect Jan. 1, 2016. According to the USGA and R&A, Rule 18-2 (ball moving at address) and Rule 14-3 (artificial devices) are among those the organizations are most commonly asked about. The above changes should help to both simplify each rule and subtly lighten the penalty for breach. The organizations also announced slight changes to the Rules of Amateur Status which will also take effect on Jan. 1, 2016. The changes involve charitable prize money, expenses and amateur status reinstatement. Prize Money to Charity - New Rule 3-1b enables an amateur golfer to participate in an event where prize money or its equivalent is donated to a recognized charity, provided the approval of the governing body is first obtained in advance by the organizer. Golf-Related Expenses - New Rule 4-3 clarifies that an amateur golfer may receive reasonable expenses, not exceeding actual expenses incurred, for non-competition golf-related activities. Former Rule 4-3 becomes Rule 4-4. Reinstatement to Amateur Status - The recommended guidelines on periods awaiting reinstatement are amended to provide that a period in breach of the Rules of up to six years (previously up to five years) should result in a period awaiting reinstatement of one year. The next rules review will occur from 2016-2020 with results likely to be announced in late 2019.